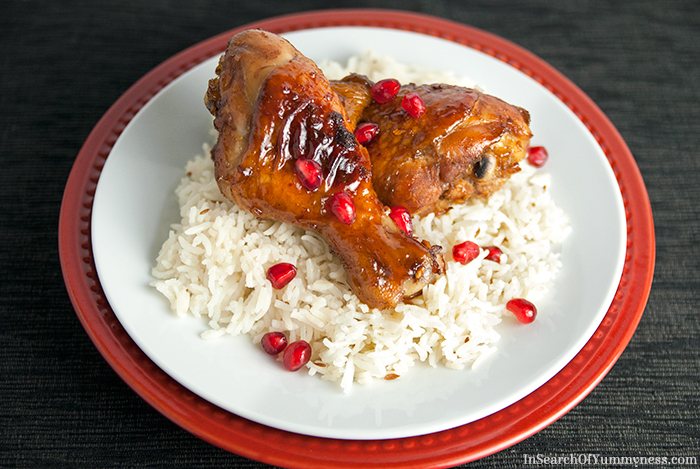 Baked chicken with pomegranate molasses makes a delicious dinner with basmati or saffron rice. This post has been sponsored by Maple Leaf Prime. It’s been a crazy week! 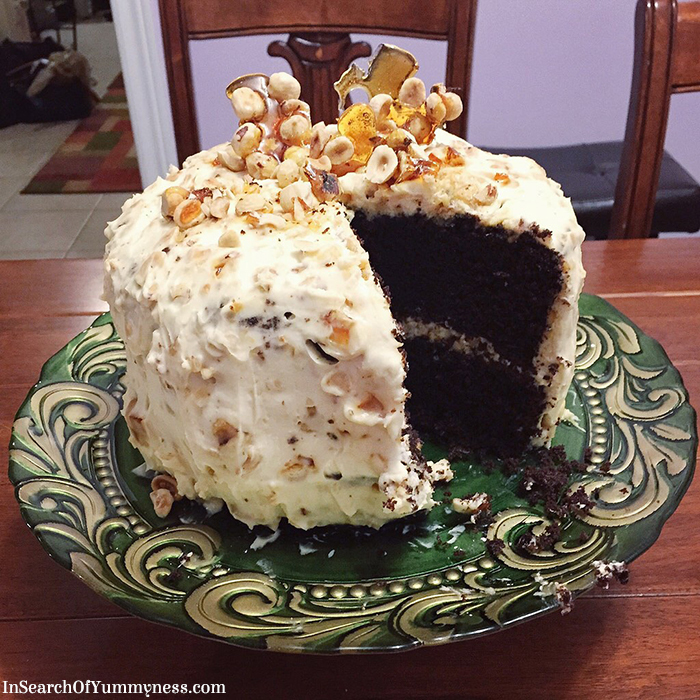 I celebrated my birthday a few days ago, which involved baking a delicious Hazelnut Crunch cake! This was my first attempt at baking a chocolate cake from scratch, and I have to say it turned out really well. I also went out for dinner with friends on Monday and Tuesday night, and yesterday my mom took me to the Nutcracker High Tea at the Shangri-La Hotel in Toronto. I highly recommend taking part in this event if you’re in or near Toronto! I had a great time at all of my outings, but they all involved me eating rich and calorie-heavy food. Not that there’s anything wrong with that! I do love to eat, but today I was craving something a bit healthier. Something simple, that wouldn’t take a lot of work. I ended up making baked chicken with pomegranate molasses glaze, which sounds much fancier than it really is. This chicken dish combines the sweet and tangy flavours of pomegranate molasses with garlic, ginger and chilli. Once baked, the chicken has a distinctly tangy flavour with a bit of zip from the spices. If you like stronger flavours, you can increase the quantities of the spices that I used. You could also make a dipping sauce by doubling the glaze, and reserving half for serving. If I have the time, I like to marinate my chicken for at least 30 minutes in the fridge. This helps to build flavour, especially in a dish like this where the chicken isn’t in the oven for very long. I also recommend glazing the chicken in layers, instead of dumping all of it on the chicken at once. This way, most of the glaze will stay on the chicken instead of burning on the pan! Did you know that Maple Leaf Prime Naturally Chicken Drumsticks are from chickens raised without antibiotics? To learn more about this product, and others, visit MapleLeafPrime.ca. Chicken and rice is a staple dinner combination at our house, but we like to change-up the flavours. Some days we make my mom’s Moroccan-inspired chicken stew with basmati rice. Other days we make a simple lemon and rosemary roasted chicken, and serve that with saffron rice. Today my mom suggested pairing this sticky glazed chicken with pomegranate molasses with cumin rice, which turned out to be a nice combination. In a large bowl, combine the chicken, salt, chilli flakes, ginger, molasses, onion and lemon juice. Cover the bowl with plastic wrap, and let the chicken marinate in the refrigerator for at least 30 minutes. Line a shallow baking dish or (baking tray) with tin foil and set aside. 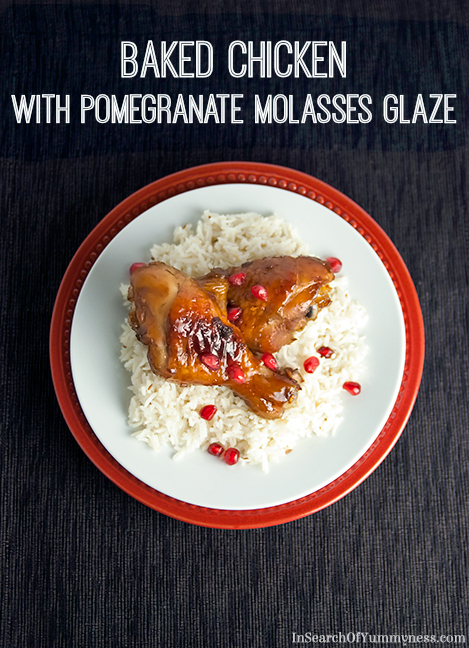 In a small bowl, combine the honey and pomegranate molasses for the glaze. Set aside for later. Take the chicken out of the fridge, and remove excess marinade. Place the chicken in the baking dish and bake in the oven for 15 minutes. Take the chicken out of the oven, and use a brush to baste the chicken with the molasses mixture. Bake for 15 more minutes and baste again. Bake for another 15-20 minutes, or until the chicken is completely cooked through. I've noticed that some brands of pomegranate molasses has more sugar than others. If the brand you're using is not very sweet, this dish will taste VERY sour. Be sure to taste it before you start cooking, and then add more honey to compensate if needed. Happy Birthday! I think you rocked at making your birthday cake.